The Northern Youth Leaders’ Forum (NYLF) has revealed a shortlist of 11 northern politicians it endorsed as potential presidential candidates for the 2019 general elections. 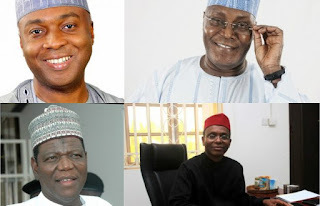 According to the leader of the group, Comrade Elliot Afiyo, the 11 persons, namely: former vice president, Alhaji Atiku Abubakar; Governor Ibrahim Hassan Dankwambo of Gombe State; Governor Aminu Tambuwal of Sokoto; the Senate President, Dr Bukola Saraki; former Jigawa State governor, Alhaji Sule Lamido; Governor Nasir El-rufai of Kaduna State; former Kano State governor, Senator Rabiu Musa Kwankwaso; former Borno State governor, Senator Ali Modu Sheriff; Governor Ibrahim Shettima of Borno State; Governor Abdul’aziz Abubakar Yari of Zamfara State; Alhaji Tanimu Turaki, and Senator Bala Muhammed; have emerged as respectable presidential candidates from the North. The group said it was disturbed by the ‘scheming’ and ‘maneuvers’ in the country suggesting southern interest in the 2019 presidency and reiterated that the north should retain the presidency in 2019. Comrade Afiyo said: “We want to reiterate and clearly warn that the North will not, and will never allow presidency to move to the South in 2019. Afiyo said the group had forwarded the names of the endorsed persons to its patrons and the leadership of the 42 affiliated organisations to Northern Youth Leaders Forum (NYLF) for screening and for the endorsement of only two candidates who will be considered during its 15th Annual National Convention coming up in September, 2017, in Kano. “We want to send a message to all political parties that may field southern presidential candidates in 2019 election that such action will amount to committing a political suicide,” a statement by the group said. It warned northern leaders to desist from supporting candidates from the South and insisted that such action would be counter-productive to their irreversible decision for a 2019 northern presidency. The group further called on all northern youths to embrace dialogue and peace, and not to allow themselves to be swayed by those who use religion and ethnicity to divide the north and gain political advantage. The group said its actions were always guided by national interest far above any other interest. On the quit notice to Igbo by some sections of the Northern youth group, Afiyo said the youths were angry members who felt they were used and abandoned by the All Progressives Congress (APC) politicians. “We consider the quit notice as ill advised, ill-timed and uncalled for. “We strongly believe the groups of northern youths were motivated, encouraged and sponsored by some individuals who felt cheated by both the federal government and some state governments controlled by the APC. “These individuals were used and dumped; no recognition or appreciation was extended to them. “They are, therefore, bent on destabilizing the government,” he said. The statement further said: “We condemn in strongest terms, the approach of our brothers in issuing an ultimatum to Igbo. No nation or ethnic nationality can survive on its own without the support and help of another. The forum advised all groups to operate within the ambits of the rule of law and strongly condemned the use of violence and hate speech in the country. It also called on the federal government and the Inspector General of Police to, “withdraw, forthwith, the directive to arrest the signatories of the Kaduna declaration. The statement went on to appeal to Acting President Yemi Osinbajo to call for a meeting of genuine leaders of the northern youths and southern youths to find a way forward for the country. The group challenged the presidency to release the reports of the past constitutional conferences and constitute a committee to look into the recommendations of the conferences with a view to charting a way forward on restructuring the country.